So I was playing early in the morning with my golf buddy at Forest City National in London. We were on the 13th, about 158yds from our tee deck. The wind was slightly in our face. The green is elevated, and protected by a front bunker. No good placed to miss: waste bunker left, death long, and trees and tough uphill pitch await right. I had the honour. I hit a solid shot. It was just left of the flag, heading over the right side of the bunker. We saw it take a bounce right, and then it rolled for a second or two. The ball then suddenly disappeared! My initial thought was 'did that just happen?' followed by 'I'd better not be long, I hit an 8!" 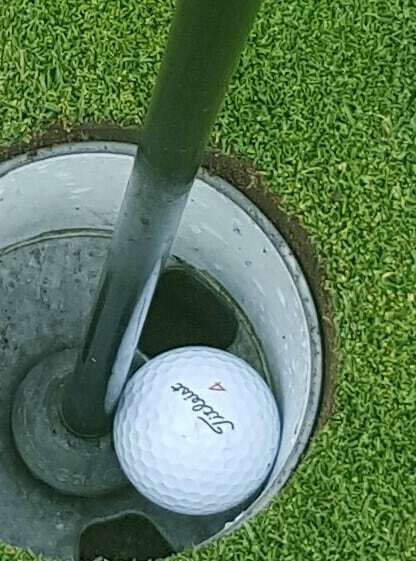 My buddy hit his shot, which ended up on the fringe. We made our way to the green and I had a quick look over the back and saw nothing. I then checked the whole and sure enough, there was my ball! The craziest part is we were only 2, and we finished our round by 10am, well before the bar opened!